Many of my kids are voracious readers and love finding new books to read. We've found, though, especially with the boys, that once you get past the Hardy Boys and Harry Potter you enter an adult world of books which often have a little more romance and graphic violence than middle school kids need or can really relate to. 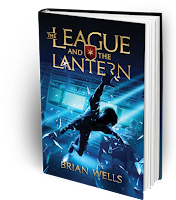 I was recently introduced to Brian Wells' new novel The League and the Lantern, and I have to say it really fits the bill for middle school boys (and Moms ... I really enjoyed this book) by being entertaining, suspenseful, age appropriate, and a whole lot of fun. I'll be the first to admit that when I heard it was for middle school boys I was, as is my usual, very skeptical. I was expecting a bit of brain candy with no real substance. Before opening the package I told my son, Kaden, that I needed him to read the book, but inside I was cringing a bit thinking I was giving him something he'd feel was beneath his abilities and maturity. My bad. This book nails it. It begins with adventure and adventure happens on every page of the book. 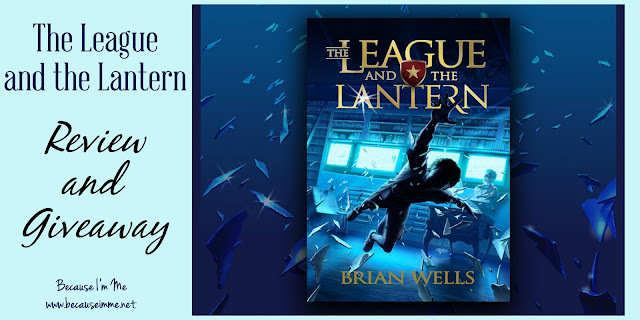 The words aren't small and simple, with the top 140 works middle schoolers need to know subtly blended into the text, and neither is the plot, full of twists and surprises. The book is very, very engaging, and even I was hooked from the first page. The book begins when we meet Jake, a seventh grader starting a new school, who is in the midst of recovering from a near drowning in a local fountain. Jake doesn't have the best of luck in social situations and being the new kid doesn't help. But he perseveres as best he can. He and his 7th grade class are having a sleepover which is invaded by a dangerous organization. What follows is 48 hours of excitement as Jake and his new classmates TJ and Lucy fight to survive on the streets of Chicago with new adventures meeting them at every turn of the page. The three unlikely companions learn to work together and develop a strong bond and friendship through understanding, humor, and compassion. Brian Wells wrote The League and the Lantern to fill a void, seeing a need for great engaging entertainment options for his own kids. To get the book to print and distributed he created a Kickstarter campaign to raise $10,000. That goal was met in the first four hours and amount raised in 30 days was a crazy $62,000. Kaden, 13, gives the book a thumbs-up, and he's already looking forward to a sequel. He really devoured the book and is excited to have River read it when he's old enough. You can get your own copy of this book from LeagueandLandern.com, $16.99 plus shipping for the hardcover book and $7.99 for the e-book. The book is written for ages 9-14, but will appeal to older kids/adults as well. You can also find a preview of the first six chapters of the book at that site. I'm really excited to share that I have a copy of the book to give away! Just leave a comment below (any comment at all - makes no difference what it says, but something fun would be great!) to be entered to win and I'll choose a winner next Saturday morning, May 21st. Good luck!! This book sounds like a fantastic Summer read for my son! He is the perfect age and loves these types of adventure stories! This book would make a great summer reading adventure.